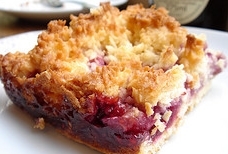 These raspberry dream bars are just that; dreamy. A lemony cookie crust is topped with a raspberry filling. It is a wonderfully delicious bar recipe. Sift together 1-1/4 cups flour, baking powder and salt. Cream together butter and 1/2 cup brown sugar until light and fluffy. Stir in lemon juice. Cut in flour mixture until it resembles coarse crumbs. Press firmly in the bottom of a ungreased 7x11" pan. Bake for 15 to 20 minutes. Meanwhile, blend together eggs, one cup brown sugar, 1/4 cup flour and the vanilla. Stir in coconut and nuts; reserve. Cool cookie layer in pan on a wire rack for 5 minutes. Break up raspberries and spread evenly over cookie layer. Spread reserved coconut mixture over raspberries. Return to the oven and bake 30 to 35 minutes longer, or until golden brown. Cool in pan for 5 minutes, then cut into squares. Cool another 30 minutes before removing from pan. Makes 32 bars.